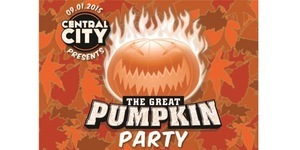 On September 1st Central City Pub in Vancouver held “The Great Pumpkin Party” a harvest themed dinner and launch party for the brand new Patrick O’ Pumpkin Barrel Aged Imperial Pumpkin Ale. The tickets cost $30 and included 3 drink tickets, entree and dessert. When the event began Gary Lohin tapped pumpkins that had their new beer Patrick O’ Pumpkin in them. The Pub had both Patrick O’ Pumpkin as well as the Red Racer Pumpkin Ale on tap as they are both coming out this September. Once everyone had settled in and had some beer we were able to trade our food tickets in for the meal. The meal consisted of BBQ Brisket, Smoked Pumpkin Croquette, Pit Beans, Pumpkin Seed Slaw, Pumpkin Cornbread Muffin. With both beers being pumpkin beers it only made sense to make the entire meal with pumpkin as well. The food was all really good especially the brisket and the pit beans! For dessert there was a pumpkin pie. Central City Brewers & Distillers really outdid themselves with this dinner! I look forward to future events in the same vain! This entry was posted in Brewmasters Dinner, Tasting Event and tagged barrel aged imperil pumpkin ale, bc, beer dinner, canada, central city brewers & distillers, central city brewers and distillers, craft beer, dinner, imperial, patrick o' pumpkin, patrick o' pumpkin barrel aged imperial pumpkin ale, pumpkin dinner, pumpking ale, Red Racer, red racer beer, vancouver.